[S1406] Maggie Bagwell Morris Grave Stone, Find a Grave, www.findagrave.com. Minerva Emaline Bagwell was born on 26 December 1899 in Antioch, Calhoun County, Mississippi. She was the daughter of William Lemuel Bagwell and Annie Eleanor Adams. Minerva Emaline Bagwell married George Washington Ivy on 29 April 1920. Minerva Emaline Bagwell died on 27 October 1996 in Southaven, DeSoto County, Mississippi, at age 96. George Washington Ivy was born on 5 September 1899 in Calhoun County, Mississippi. He married Minerva Emaline Bagwell, daughter of William Lemuel Bagwell and Annie Eleanor Adams, on 29 April 1920. George Washington Ivy died on 4 December 1972 in Oxford, Lafayette County, Mississippi, at age 73. [S1407] Annie Eliza Davis Bagwell Grave Stone, Find a Grave, www.findagrave.com. [S2218] Annie Eliza Davis Bagwell Grave Stone, Find a Grave, www.findagrave.com. Lorie (?) married Tony Lynn Bagwell, son of Alton Thomas Bagwell and Mary Lou Flowers, after 1975. [S1408] Email from Tony Lynn Bagwell dated Aug 2010 to Hunter Wayne Bagwell - Subject Line: Bagwellls. Willis Early Bagwell, 75, of Bruce, Miss. Route 1 died at his home Sunday of an apparent heart attack. He had been in ill health for a number of years, but had attended church services at Antioch Sunday Morning. A retired farmer, Mr. Bagwell was born at Sarepta, Miss., Calhoun County February 1, 1891, the son of James Wiley Bagwell and Annie Eliza Davis Bagwell. He was a Baptist and a Mason. Services were held at Mt. Moriach Baptist Church Cemetery at 2 p.m. Monday with Rev. John Couch and Rev. W. C. Johnson officiating. Burial was in the Antioch Cemetey with Masons acting as pallbearers. Mr. Bagwell leaves his wife, Mrs. Esther Robertson Bagwell, Bruce, Miss; three daughters, Mrs. Sam Baker, Banner, Miss., Mrs. Wilmer Addington, Memphis, tenn., and Mrs. Joe Reavis, Atlanta, Georgia; two sons, Edward Earl Bagwell, Bruce, Miss., and Wilburn Bagwell, Memephis, Tenn; a sister Mrs. Ruby Smith, Banner, Miss; a brother, Doyle Bagwell, Bruce, Miss; 12 grandchildren, and seven great-grandchildren. [S2216] Willis Early Bagwell Grave Stone, Find a Grave, www.findagrave.com. [S2221] Ester Hazel "Estee" Robertson Bagwell Grave Stone, Find a Grave, www.findagrave.com. Shirley Mae Bagwell was born on 18 July 1919 in Calhoun County, Mississippi. She was the daughter of Willis Early Bagwell and Ester Hazel Robertson. Shirley Mae Bagwell died on 25 September 1924 in Calhoun County, Mississippi, at age 5. She was buried at Mount Moriah Baptist Church Cemetery, Bruce, Calhoun County, Mississippi. William Bagwell was born on 18 November 1914 in Calhoun County, Mississippi. He was the son of Willis Early Bagwell and Ester Hazel Robertson. William Bagwell died on 4 December 1914 in Calhoun County, Mississippi. Wilma Doyle Bagwell Addington, 69, of Bruce, Miss., died Sunday, April 19, 1992, at Bruce Extended Care Facility in Bruce, Miss., Calhoun County. A furniture store owner, she was born March 9, 1923, in Calhoun County, Miss., the daughter of Early Bagwell and Ester Robertson Bagwell. Funeral services is today (Wednesday) at 2 p.m. at Parker Memorial Funeral Home Chapel with Rev. Jerry Smith and Rev. Jimmy Sockwell officiating. Burial will be in Mt. Moriah Cemetery near Bruce, Miss. Leonard Okney Bagwell was also known as Leonard Oakley Bagwell. He was born on 14 August 1887 in Calhoun County, Mississippi. He was the son of James Wiley Bagwell and Annie Eliza Davis. Leonard Okney Bagwell married Annie Lee Gill circa 1910. Leonard Okney Bagwell died on 28 January 1960 in Calhoun County, Mississippi, at age 72. Charlie Buford Bagwell was born on 13 October 1911 in Calhoun County, Mississippi. He was the son of Leonard Okney Bagwell and Annie Lee Gill. Charlie Buford Bagwell died on 26 January 1971 in Calhoun County, Mississippi, at age 59. James Wiley Bagwell was also known as Bill Bagwell. He was born on 30 March 1912 in Calhoun County, Mississippi. He was the son of Leonard Okney Bagwell and Annie Lee Gill. 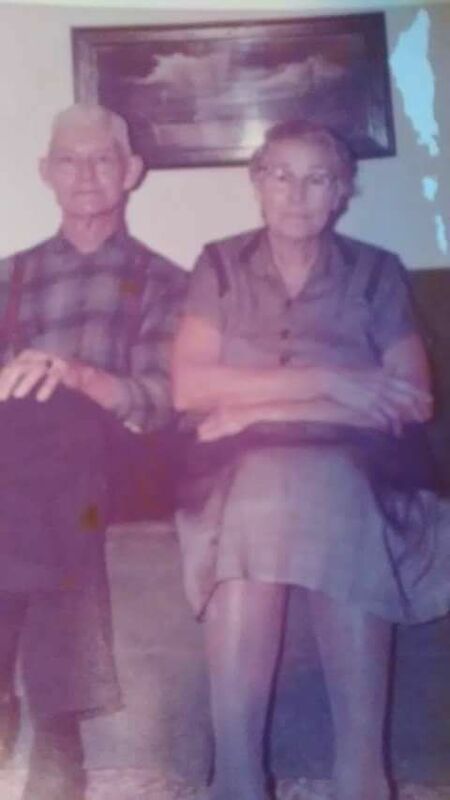 James Wiley Bagwell married Francis Mauvalene Long before 1935. James Wiley Bagwell died on 7 January 1965 in Calhoun County, Mississippi, at age 52. Samuel Percy Bagwell was born on 17 July 1919. He was the son of Leonard Okney Bagwell and Annie Lee Gill. Samuel Percy Bagwell married Hilda Maxine Williams after 1937. Samuel Percy Bagwell died on 29 April 1991 in Neshoba County, Mississippi, at age 71. Mary Etta Deweese was also known as Etta Deweese. She was born on 26 April 1887 in Dexter, Kansas. As of 27 April 1904,her married name was Bagwell. She married William Washington Bagwell, son of Thomas Coffey Bagwell and Sophiah Elizabeth Hawkins, on 27 April 1904. Mary Etta Deweese and William Washington Bagwell were divorced between 1930 and 1940. Mary Etta Deweese died on 19 May 1965 in Oklahoma City, Oklahoma, at age 78. Velma Bagwell was born on 3 May 1912 in Oklahoma. She was the daughter of William Washington Bagwell and Mary Etta Deweese. As of before 1930,her married name was Covalt. Velma Bagwell married Theodore Covalt before 1930. As of after 1940,her married name was Johnson. Velma Bagwell married (?) Johnson after 1940. Velma Bagwell died in January 1994 at age 81. She was buried at Chapel Hill Memorial Gardens, Kansas City, Wyandotte County, Kansas. Clarence V. Bagwell was born on 11 May 1908 in Oklahoma. He was the son of William Washington Bagwell and Mary Etta Deweese. He served as a 1st Gunner Mate in the US Navy. Clarence V. Bagwell died on 10 February 1982 in New York at age 73. He was buried at Calverton National Cemetery, Calverton, Suffolk County, New York. Otice Morey was born on 15 August 1900. He married Viola Susie Bagwell, daughter of William Washington Bagwell and Mary Etta Deweese, in 1923.1 Otice Morey died in January 1941 in Kansas at age 40. Georgia Lee Looney was born on 19 March 1883 in Arkansas City, Arkansas. She married Jesse Bradford Bagwell, son of Thomas Coffey Bagwell and Sophiah Elizabeth Hawkins, on 14 July 1898 at Eufaula, Mcintosh County, Oklahoma. Georgia Lee Looney died in January 1968 in Scottsdale, Maricopa County, Arizona, at age 84. [S1748] Email from Terry Hicks dated April 2011 to Hunter Bagwell - Subject Line: Lottie Marie Bagwell. Lucille Bagwell was born circa 1913 in Oklahoma. She was the daughter of Jesse Bradford Bagwell and Georgia Lee Looney. Lucille Bagwell died circa 1915 in Oklahoma.